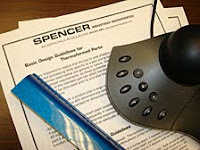 It is our recommendation that each part be discussed prior to and after the quoting process. We have published our Basic Design Guidelines to help you in the design process. We stand ready to assist in these discussions and any questions that may arise. Materials chosen for a product play a large role in the tolerances of a part. These guidelines are based on experience with dimensionally stable resins such as HIPS, ABS and TPO. They guidelines would also not be recommended for dimensionally sensitive materials such as HDPE, HMWPE, PP,etc..
All trimming is done at ambient plant conditions. Dimensions are based on these temperatures.If parts are measured subsequently in varied temperature conditions, dimensions will change. All materials have differing thermal expansion rates. If wide temperature swings will affect the part it should be noted up front so adequate steps can be taken to insure that the part will function as designed. Please Rate our Thermoforming Design Guidelines here!